Minimum Flows and Levels (MFLs) set water flows, levels, and limits necessary to prevent significant harm to the water resources or ecology of an area from water withdrawals. Implementation of an effective MFL program is an important part of the District’s overall effort to ensure the long-term protection and sustainability of regionally significant water resources. The program complements other efforts, including consumptive use permitting, regional water supply planning, and watershed restoration. Florida law (section 373.042(1)) requires each water management district to develop and set MFLs to protect Florida’s waterbodies, including springs, rivers, and aquifers. MFLs are calculated using the best available information and science, considering natural seasonal fluctuations; non-consumptive uses, and environmental values associated with coastal, estuarine, riverine, spring, aquatic, and wetlands ecology, as specified in section 62-40.473, Florida Administrative Code.The process of establishing an MFL involves a series of steps ranging from the identification of priority waterbodies for which MFLs will be established to the adoption of District rules codifying each. The District is committed to moving forward with MFL development, and has set an ambitious, yet realistic schedule. 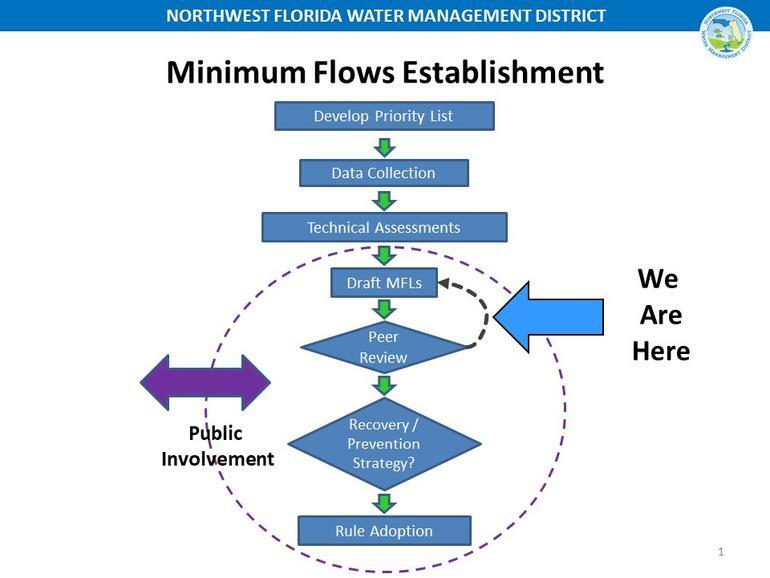 Each year, Florida's five water management districts must submit a priority list and schedule for the establishment of MFLs within their region to the Florida Department of Environmental Protection for review and approval. The work plan is a guidance document that outlines the organization and general technical components necessary to develop and establish MFLs for the St. Marks River Rise, Wakulla, and Sally Ward springs (see Location Map). Details regarding specific methodologies for each component will be developed as individual tasks are initiated. The document also includes general plans for public involvement activities and when the technical assessments are complete, voluntary peer review. A water reservation is a legal mechanism to set aside water from consumptive uses for the protection of fish and wildlife or public health and safety, authorized by Florida Law (section 373.223 (4), F.S.). Water reservations and MFLs are both important tools to ensuring an adequate supply of water for the citizens and environment of Northwest Florida, and the District remains committed to collecting and using the best available science as we evaluate the most effective ways to protect water resources. Reservations were established in 2006 (section 40A-2.223, F.A.C.). The magnitude, duration and frequency of observed flows are reserved, essentially in total, for the protection of fish and wildlife of the Chipola River, Apalachicola River, associated floodplains, and Apalachicola Bay. As the Apalachicola and Chipola rivers are presently subject to a water reservation, they are not included in the District’s current MFL schedule. Under these reservations, all water in the rivers is protected for the health of the river systems.